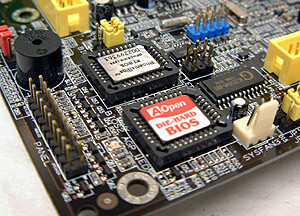 The AOpen AK79G MAX is probably one of the best equipped motherboards of the roundup. With built in GeForce4 MX, 5.1 audio, 10/100 LAN, Serial ATA, IEEE 1394, dual BIOS's and an extra parallel IDE channel thrown in what more could you ask for? Oh before I forget, AOpen also includes an excellent software bundle which includes Norton AntiVirus 2003 and a whole host of other useful utilities. Of course all these goodies come at a cost and the AOpen AK79G MAX is the most expensive motherboard of the roundup at $183 CDN ($135 US). In terms of motherboard care, AOpen does one better then any other motherboard in this roundup in terms of cooling. They not only actively cool the Northbridge, but they also cool the southbridge with a passive heatsink! The layout of the board is great, and you're not going to have problems using longer AGP/PCI devices. Recently when I killed a MSI 875P Neo-FIS2R motherboard flashing the BIOS (a known problem with that board) I found out how useful dual BIOS's really are. Instead of waiting for a second motherboard which came about two weeks later, all I have to do is swap a few jumpers and I'm set! 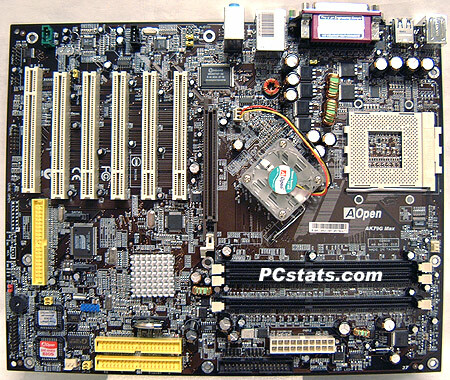 All manufacturers should incorporate dual BIOS's with their boards as it just makes things easier on the end user. While I know AOpen has many OEM partners, as a consumer I would have liked to see a sixth PCI slot instead of the "ever" useful CNR at the bottom of the motherboard. Probably my biggest qualms with the AK79G MAX though is the position of the clear CMOS battery. Attached to the motherboard via only three solder points it could easily snap off and damage the motherboard elsewhere. The AOpen AK79G MAX is a very feature rich mobo and if you have the needs for most of the features then the board is pretty well priced. If you don't need all the goodies, then you're probably going to want to look elsewhere as the board is the most expensive of the roundup.